~~> Get ready for some musical fun with the loveable Care Bears! 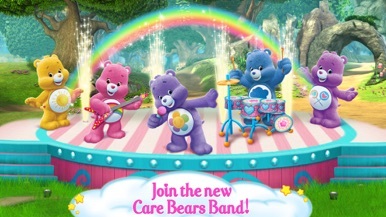 ~~> Help Harmony Bear spread joy, smiles, and start a new Care Bears band! ~~> Light up the faraway land of Care-a-Lot with your cheerful songs and colorful rainbows! There’s always a new rainbow-filled adventure happening in Care-a-Lot, and now you can be a part of it! 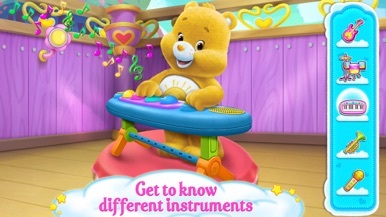 Harmony Bear is starting a Care Bears band, and all the bears need your help making amazing music and sharing their cheerful beats! Create music that shows the world how important friendship, caring and sharing is! > It’s your job to help Grumpy, Harmony, Share, Cheer and Funshine practice their music. > Now’s your chance to be a DJ! Record your own beats and add awesome special effects to create beautiful, colorful music. > Get the adorable bears ready for the big music concert, and make sure they play the best music Care-a-Lot has ever heard. 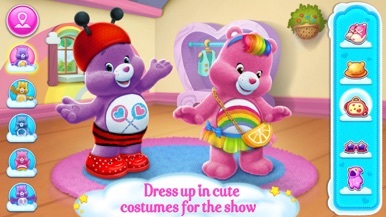 > Dress up in cute costumes with the cuddly Care Bears! The funny accessories and costumes will fill you with happiness. > Uh-oh! One of the instruments broke. Fix it at the repair shop before it’s time for the show. > Design the stage for the big concert - make it extra colorful so the Care Bears will love it. 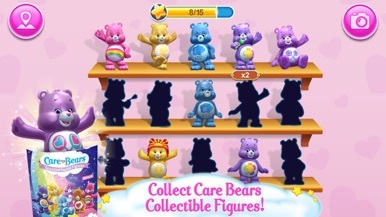 > Make a rainbow with the Care Bears badges, and get virtual blind bags with surprise presents! > Take selfies with your huggable Care Bears friends and save the photos. > Bathtime has never been so fun! Take a musical bath with singing Care Bears. > Start your own Care Bears collection - collect Care Bears Collectible Figures. > Have a blast with beautiful Care Bears coloring pages. 3D Characters Two Sticker Pack! 3D Characters Two Sticker Pack! for iMessage. Hope you enjoy! Thank you for purchasing these stickers. Please see our other stickers by clicking on our name "Howtobewebsmart" in the app description above. With your support, we can frequently release new stickers in the app store!